Regardless, we will see Tom Green leading his men, doing whatever it takes (even perhaps trying on a gown . 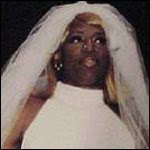 . . eat your heart out Rodman!) in his face off against Brande and the women. Green as PM in this task makes me kinda nervous, as I'm finding myself to be a fan of his, but I think he'll be alright. After all, he did just beat an Olympian (and we all know how the Donald favors Olympians). So who would you all like to see walk down the aisle, as in, back home? Tom can be a bit annoying though. He has ther personality of a Jack Russell, and they can be cute and funny or HIGHLY energized and crazy! We'll see how he does as PM. Unless Rodman saves himself with a little effort this week, he needs to be GONE!